This first item is the Roommate's sarong for our 2 month trip to Indonesia. Sarongs & sashes are required for many formal events (shrine festivals, theater performances), so these wearable souvenirs were one of the first things we bought. 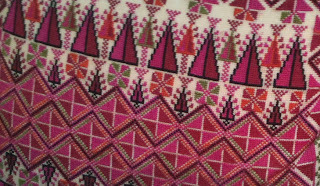 This is ikat, which I always think of as a fuzzy design. Ikat is when the weft threads on a loom are dyed, then manipulated a bit so the edges of a design are not crisp. There is also double-ikat, which is when both the warp & weft are dyed & manipulated. Whitney Matalone has posted a riveting time-lapse video here. Ikat is called kasuri in Japan and is usually just done w/ two colors there. Typically indigo & white or, less often, brown & white. But you can see that in Indonesia, it's done with many different colors. Either way, I find ikat pretty amazing. 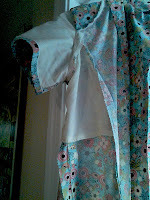 As with batik, it takes a lot of planning & prep, but I think you'll agree it pays off in the end! 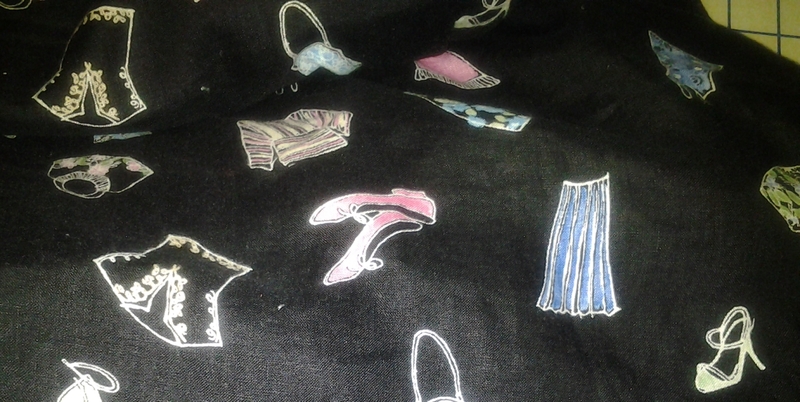 the sarong, making a less detailed pattern. Here we have the ever-handsome Roommate/Spokes-model showing off a new shirt I just now finished. Bits of Thread, where I take sewing classes, has a fabric "recycling" program, where they get fabric & notions donated to Goodwill & the Salvation Army and sell it quite cheaply ($3/yard). 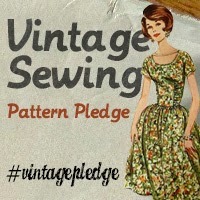 The proceeds go to fund free sewing classes in DC. So, even though this is the thirtieth (yes 30th!) fun shirt the Roommate has, and all the rest were made overseas...he now has yet another, made in USA, and I made it, using Vogue 8800. Problem is, when I saw this math-related fabric, in an amazing color, I just couldn't resist, and knew he'd love it, too; even though we can all agree that he has way too many fun shirts. This is especially suitable since he loves teaching math to his fifth-graders. And I've been wanting to try out a simpler style shirt, as I work up my nerve to copy Zo's cowboy shirt she made for Paddy. I've been wanting to make a western shirt for the Roommate ever since we saw Cracker/Camper Van Beethoven last month (amazing show, BTW). And both David Lowery and Johnny Hickman had on western shirts. Guitarists always look cute, so I decided the Roommate needed one, even though he's not a guitarist and looks cute even without a western shirt. Also, I'm having a slight bit of guilt as when we finally started dating, as opposed to being just friends, I made him get rid of his polyester shirts, his bell-bottoms, and his western shirts. My only regret is the western shirts, though! 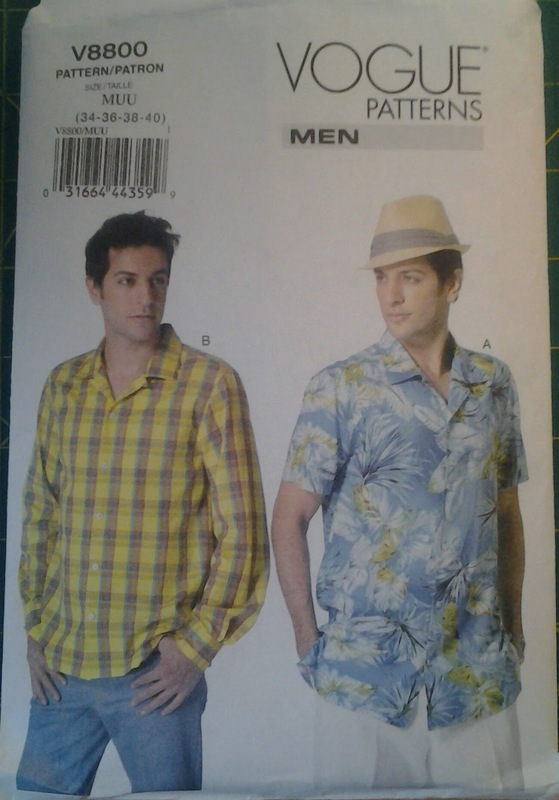 So I figure he needs one now, and I have the perfect fabric for it (a surprise). But, I wanted to try out an easier man's shirt first, so Vogue 8800 was it. I think it came out pretty well, and he's pleased, too. He's got some classes next week at the NEA, so an education-oriented shirt will be appropriate. 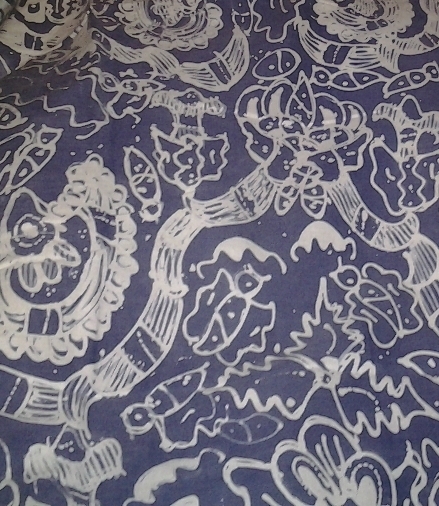 Indigo Batik - from the Vault! 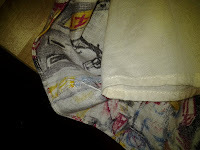 On the left, below, is the sarong I mostly wore during our 2 months bumming around Indonesia in 1995. 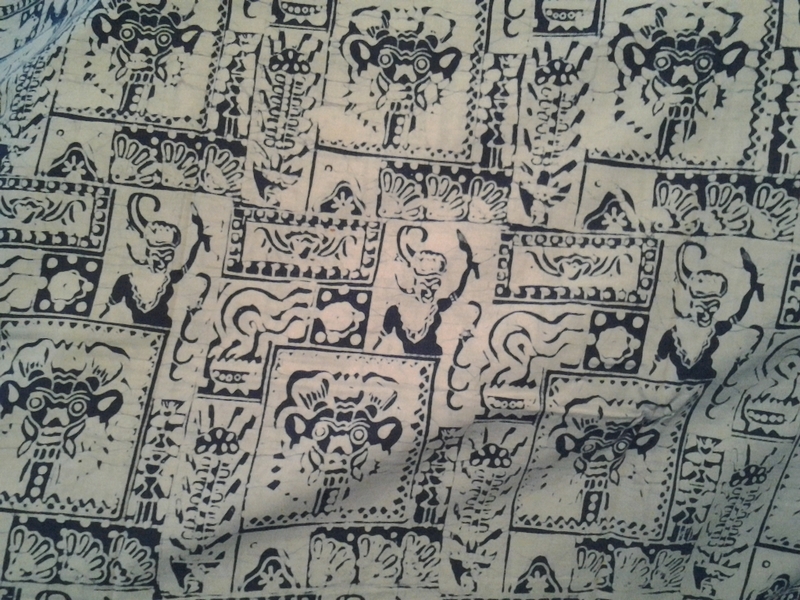 For visits to all shrines and some performances (shadow puppets, kecak dance, traditional dance), a button down shirt & sarong & sash were required for both the Roommate & I.
I believe it was made with a stamp? Or a printer? Is there a printer that dispenses hot wax? I should look into that. 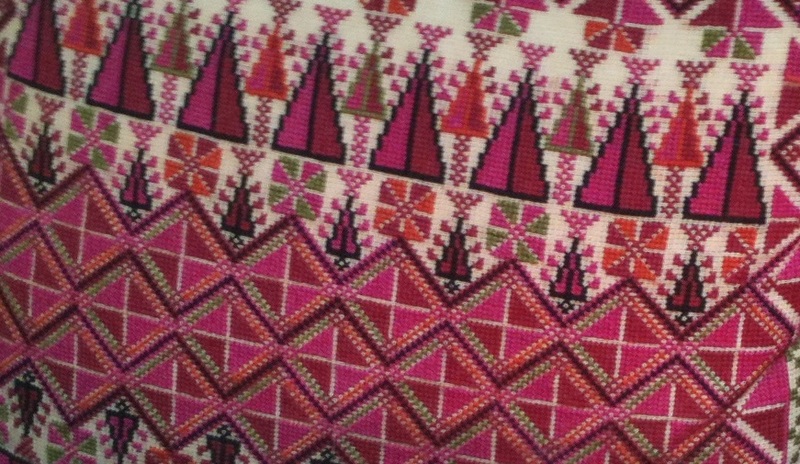 The pattern is very regular overall. The link for tjanting will take you to Dharma Trading, where you may want to have a look at some of the batik stamps, too, just to get an idea of how those work. Batik is one of those techniques that is very difficult for me to think about...because the artist must keep preserving the lighter color with wax, then dying it darker & darker & darker. 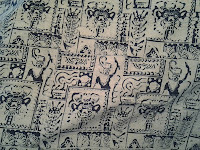 With 2 colors, it's not so difficult (though there is so much white on the first batik, above...what kind of stamp was that? )...however, it's sort of like relief carving...you have to take away the air, and leave the thing you want the carving to show. It all seems sort of reverse and counter-intuitive to me! Hope you enjoy seeing these; I'll show some more batik, from India, Africa & Java soon. Copy Your Clothes! Finished Item! I finished it! And actually, today was the 2nd time I wore it. I got a good friend to take this photo of me at work, because I also wanted to show of my new standing desk. The desk was out in the public part of the library (it's ancient), and was about to be moved downstairs to be given away or tossed, and I thought, well, I've been wanting to try a standing desk. So I put it in my cubicle, rearranged my computer & screens and now I have plenty of places to lay projects I'm working on because my computer no longer takes up that space. The first thing I did was buy an anti-fatigue mat...the cement floor underneath the thin carpet is not comfortable at all...much like standing in museums all day (which I love, but I always end up with lower back pain). The mat helps a lot. Oh, but....back to the dress! 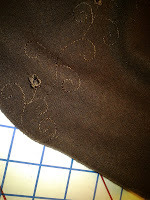 This was my first successful attempt at applying what I learned in the Copy Your Clothes class at Bits of Threads. Below you'll see the original, which Mohammed made from a photo I had brought him. I wore the dress for more than 5 years, so definitely got the use out of it, but it was faded and beginning to look beat up. So, time for a new one! I took it almost completely apart and traced all the pattern pieces. That's the easy way to copy your clothes--when you don't take them apart it's much more difficult to get the pattern pieces traced. 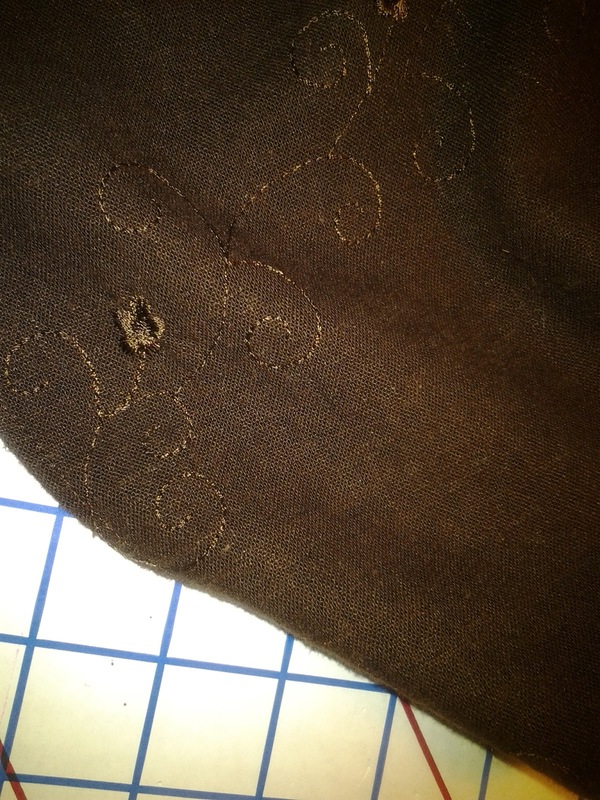 I had a few bumps along the way, mostly because the original fabric was quite thin with some give, while the fabric I got from Windham is a bit thicker cotton and doesn't have as much give, even though I was careful to place the princess seams on the bias. But it still looks great (I think) and I like it because the color's great (and goes with lots of my turquoise) and it also goes with my new black sandals! I also did a tiny bit of lining, mostly inspired by Ms. Scruffy Badger, who seems to line just about everything. It's a summer dress & summer in DC means hot & humid, so I figure anything that helps the dress (and moi!) looking nice a bit longer is worth the effort. So you're looking at an example of the mini-lining I put in, using the poly/cotton blend I picked up on a super sale at Hancock. 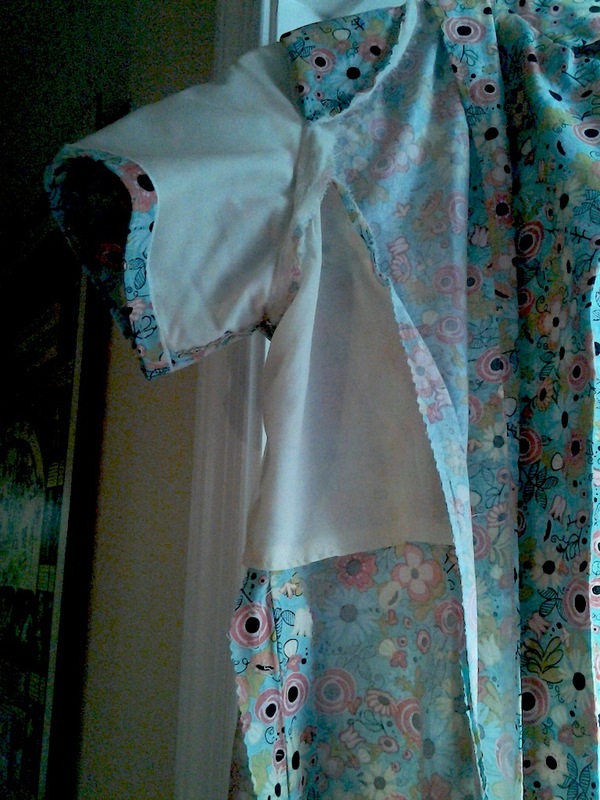 I lined the sleeve completely, then cut shorter pieces for the front & back side pieces. The dress & lining fabrics are just the right weight: they work together but you cannot see the lining at all when I'm wearing the dress. I am hoping this will protect the dress a bit and let me wear it a long long time. However, who cares if I have enough samples of this amazing work? What matters is that Bella loves it, finds it a cozy place to hang out, and it flatters her lovely coat. 3 Long Skirts, Upcoming Reveal, & It's June Already? How did that happen? 1/2 way thru 2013 almost!? And to the right you'll see a picture of the Skirt Marker in action, which should get you all excited for the big reveal. I'll get the Roommate to help mark the hem for the dress I'm copying, and with any luck I'll have a new summer dress to wear to work next week! It does seem like summer may finally be here (up in the 90sF this week) so I brought up my summer dresses yesterday (another finally is appropriate here). I think I brought them up in March last year! No complaints...it's nice to have a long lovely spring. 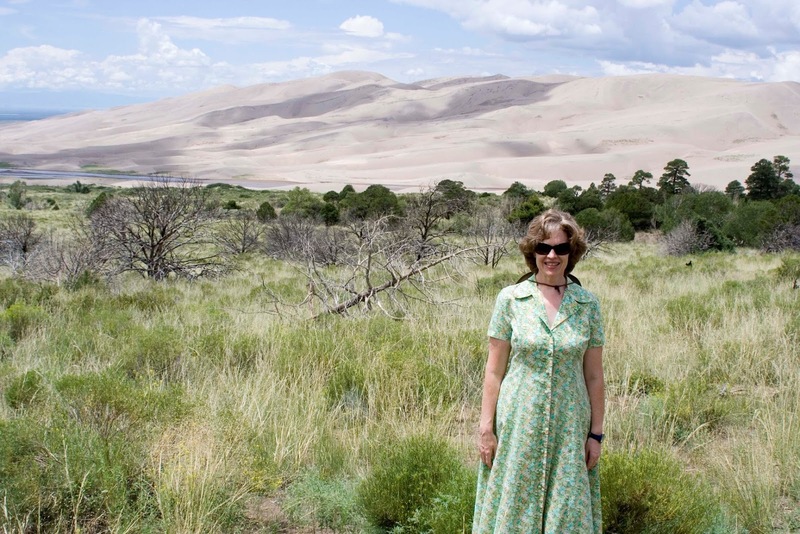 And speaking of Abu Dhabi, when bringing up summer dresses yesterday, I found 3 long (ankle-length) linen skirts I used to wear all the time when I lived & worked in the UAE, Oman & Turkey (detail of the fabric in the 3 photos at the left). They just seemed appropriate there. I wore them with sandals, but having my legs covered served 2 purposes: protected me from the sun (I wore long-sleeved, light jackets a lot, too) and showed some respect for my employers and students. I never covered my hair (I tried it once at a party and was amazed how quickly I was hot & sweaty), and since I'm not Muslim, that was never expected. More important was to dress modestly. I always feel like there's so much of me anyway, plus I do NOT tan, so dressing modestly was never a chore. Now, back in the USA...I still dress fairly modestly, but I can't imagine wearing an ankle-length skirt, unless I was going as a gypsy to a Hallowe'en party! So I am planning to cut these off by about 18". They are all linen, and the light one and the black one are lined with lovely thin cotton. Mohammed made the brown one for me, while the other 2 are Liz Claiborne. (Were these ever sold outside the Middle East I wonder? Hard to imagine a market for ankle-length linen skirts in Europe or the US...) Needless to say the sewing is quite nice on all of them & that's one reason I haven't done anything with them, though I've been back in the US for almost 4 years: I hate to ruin someone else's lovely hemming & chain-stitched lining tacks...knowing full-well I won't do nearly as nice a job. My mom is lucky she doesn't live closer--her handwork is amazing. All those tiny stitches--exactly alike. And here's Sunni, from A Fashionable Stitch showing how to make a thread chain w/ a machine or serger, though I usually make mine by hand. I'll be closely examining my new One-Yard-Wonders books to figure out how to use the pieces I've cut off (each approximately 18" x 60")! 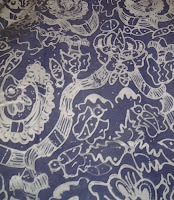 It's lovely linen & of course we love fun prints in this family. Music; sorry for the pun, but here's Jeff Beck, Hi-Ho Silver Lining.